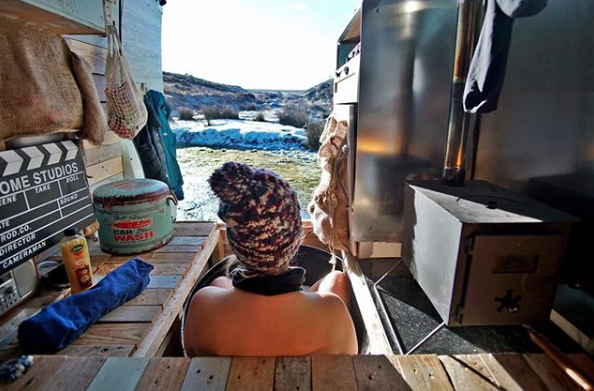 This Off Grid Girl Shows You How To Be A Vanlifer In The UK! My Name is Georgina but everyone calls me George. I’m 32 years old and currently roaming around the south west of England chasing waves in my Renault Master. I’m originally from Torquay, I went to Uni in Plymouth and studied sport coaching and physical education, then moved to Eastbourne and started a sports coaching job after 9 months I moved back to Torquay and set up my own sports coaching company. 3 years ago I sold my business and house to move into my VW caddy. I currently don’t have a job, but have made investments in crypto currency and do a little bit of match betting each month to cover food, fuel and other bits. I just love to travel and explore, kayaking, bikes, hikes, I’m currently dedicating my time to learning to surf. 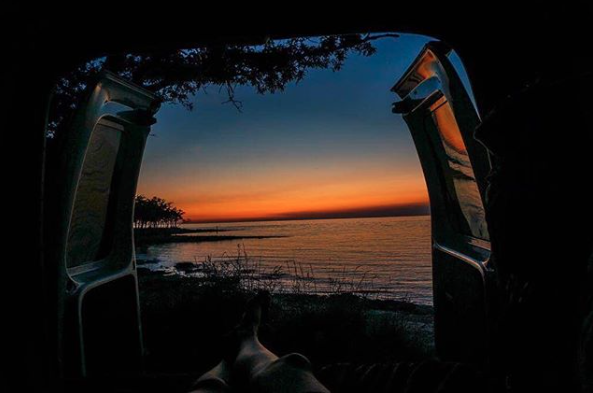 What did you life look like before vanlife? Yes I live and travel full time in my van, before this lifestyle change my life was very different. I had a sports coaching business, a house and a lifestyle that didn’t really allow me the time I needed to do the things I loved. Why did you decide to get a van? I can always remember as a kid wanting an old school baby blue VW, in 2015 my cousin brought one and took me for a spin in it, I got home that evening and started looking for vans. I had just recently bought my house, been on a few holidays, so had a budget of about 5k, an old school VW was out of the question. Plus I wanted a van that I could still use for work and then use at the weekends so I found this lush little VW Caddy. I feel in love with it! It was perfect for both. And just like driving a car. Little did I know this was the start to my new life. Taking the van out and about around Devon and Cornwall got me outside so much more than before, I loved it. weekends kayaking, hiking, exploring, beach days. With my new found love of van adventures I booked a spontaneous trip to Iceland, hired a van and drove around the country. This was the moment my life changed. Iceland was a holiday like I’ve never had before. I completely switched off from work (I had no choice there was no wifi lol) and it really got me thinking. I was waking up in the most incredible place, seeing things I would have never dreamed of seeing, just roaming around with no plan, no structure and stumbling across the most amazing things. I got back from Iceland and had some hard choices to make. In the end I made the decision to sell up everything and just go, not have a plan and see where life take me. 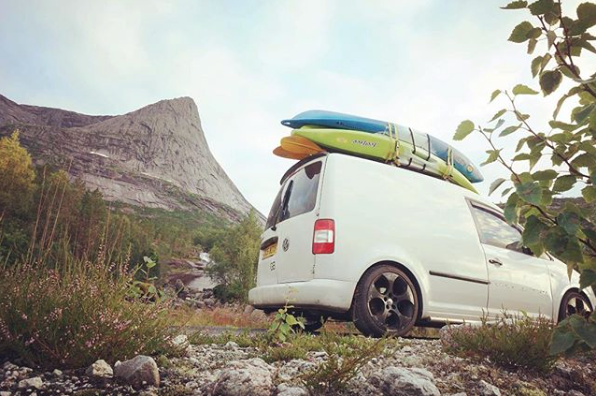 My 2005 VW Caddy was around 5k, all it had in it was a rock and roll bed, I got the garage to add a leisure battery and I put up a few hanging nets on the side for my clothes, a roof rack for kayaks and bikes, a camping stove for cooking. I loved this van as it was so cheap to run, it was small but, less room meant less stuff, I had mates travel with me all the time as well one staying for 4 months. We just made the space work, had routines. The only thing that got annoying was getting changed lying down. lol, oh and if it rain for a few days straight. 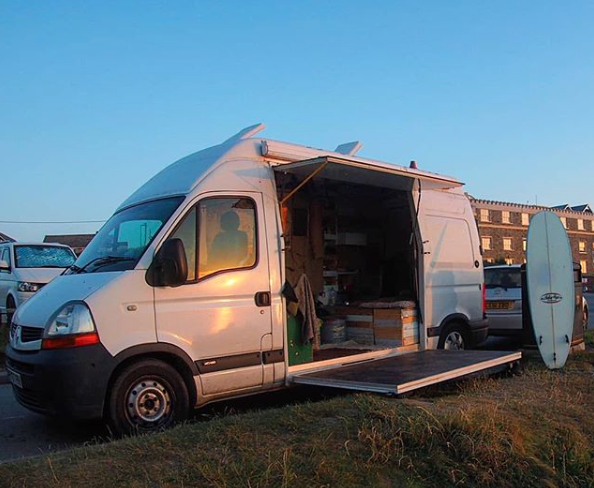 My current van is a Renault Master, soon after travelling around Europe in the Caddy, I was heading out to Asia for what I thought would be a few years. So I gave my Caddy away to one of my followers. After 5 months in Asia I came back to the UK due to a friend being diagnosed with a terminal illness. I Decided to walk the South west coast path to raise money for her to take her little boy on his first holiday. Half way through the walk my uncle passed away without warning. I took a 2 week break from the path to be with my family and headed back to the path with a VAN. While I had been back home, a friend called me to tell me about a van that she had seen for sale. I went and viewed it, saw the side door and brought it! 3.5K later. I love that I can stand up in the van, I knew when I got my next van I wanted to be able to stand up in it. I also love my log burner, anyone that’s going to spend a winter in the UK, I would 100% recommend getting one. 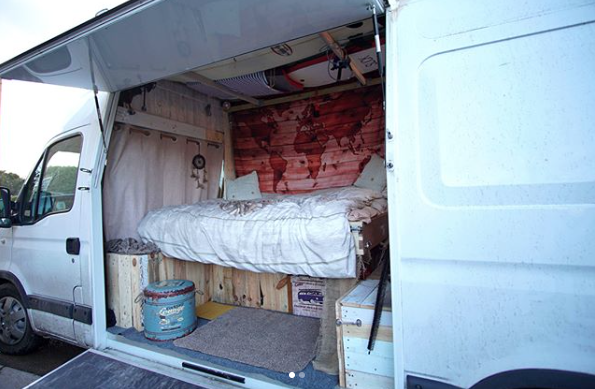 What I love most about the Van is that me and my brother made it, the time I spent with him and his family converting it was memories that will stay with me forever. Did you convert the van yourself? Yes I converted the van, well when I say I converted it, I should say I helped my brother convert it. He took my ideas and made it happen. I learnt a lot from him along the way, we had such a laugh doing it. We had no plan, we measured nothing but somehow it all came together. Best bits, were converting it with my brother, that was an adventure in itself, the worst bit about the conversion was doing it in the bloody winter! Some days were so cold we turned his kitchen into our workshop. 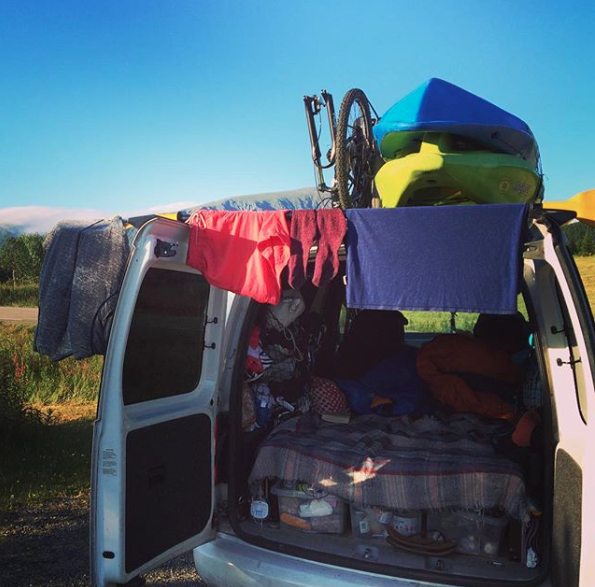 Please tell me about how much time you spend in your van and what this time means to you. Most of my day is spent outside of the van, in the sea, hiking or exploring. The time I spend in the van is cooking, sleeping and chilling. The other day I came back from surfing open the side door laid out the sofa seats and spend the afternoon reading a book. I thought about how different my life is now, I have everything I need right here on the beach. or the mountain or the wood or where ever I am. I don’t have to pack up and go home because I am home, instead I’m Sat here watching a little baby fox run through a field of sheep. I love how nothing is a rush, you have time to just sit and watch the sun go down. 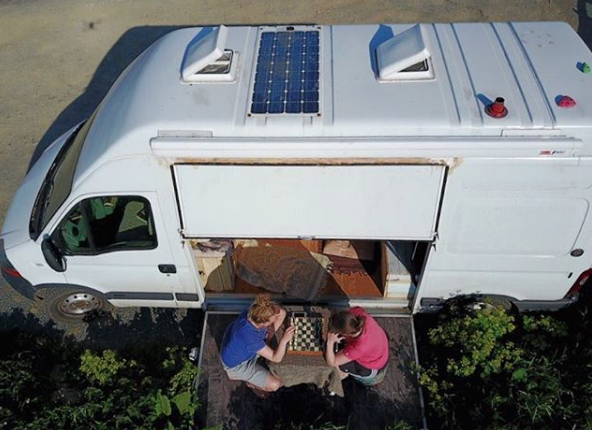 What does your van enable you to do? Live a life I never imagined was possible. 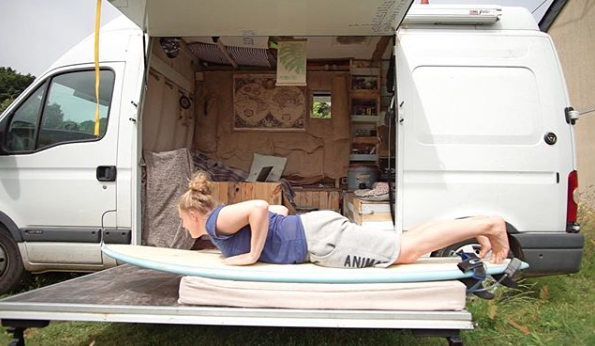 How do you feel being a woman traveling in a van? I feel fine, there have been times I have felt scared, but I think that’s more so because I over think things in my head. Mostly at night with noises, cars pulling in etc etc. This was defiantly worst when I first started, now I just talk myself out of worrying. The other night I got out of the Van to let the dogs out for the toilet. The car park was now empty other than this motorbike park up a few metres away from the van. There was a guy sat up the top of the car park I walked the dogs got back in the van and moved, something just told me to move so I did. (This hardly ever happens, but when it does I just listen to my gut). Challenges, driving big van down a small lane, lol. I’ve got used to this now I think. At the moment I travel mainly on my own, in the past I’ve travelled with friends and my partner. I really enjoy travelling with someone else, it such a laugh and you make so many amazing memories. But I also enjoy travelling on my own, you have the freedom to do whatever you want with not having to think of what someone else might want to do. 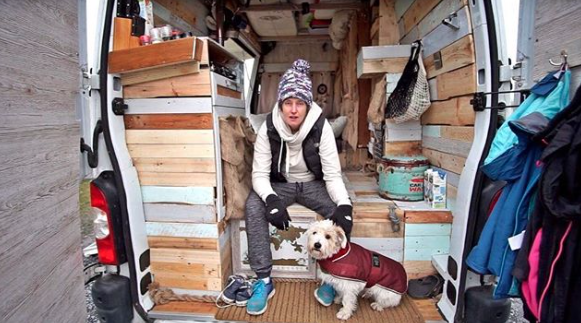 Do you think your time spent in the van has changed you as a person, your goals and aspirations or your outlook on life? Yes and no, I’m still the same driven person I was before but my drive is not to run a success business and be financial stabile, its rather the opposite, to challenge myself and my thinking. Its opened up my eyes to what’s out there and what is possible. It’s not all about earning enough money to get the latest flat screen TV, sit and be consumed by some crap on TV. it’s about getting out there doing things, meeting people, enjoying life to the fullest. Life is Short, so short. Make the most of it! Very much unplanned, I have a country in mind and then how I get there I have no idea. 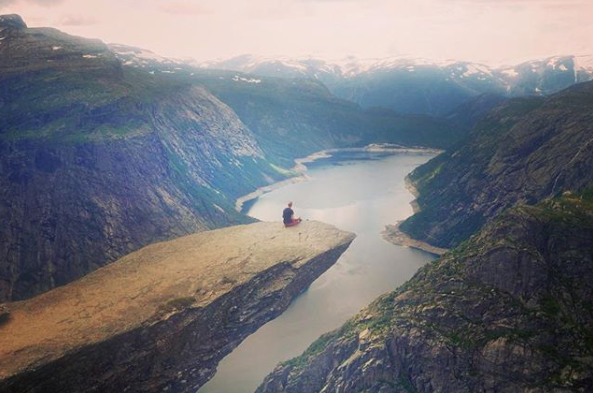 Like my last European trip, all I knew was I wanted to sit on that rock in Norway and Kayak in Croatia. Everything else that happened in between was just an added bonus. I didn’t plan to drive to the north of Sweden then across to Norway, but some locals I met in the south of Sweden invited me to join them on their holiday in the North of Sweden, so I drove up the east coast of Sweden to the North. If that had not have happened I might not have discovered the beauty of Loften, or discovered the world’s strongest tidal pools, or even climb a glacier. I didn’t plan on being mesmerised by Slovenia but it happened and I ended up spending over 2 weeks waterfall hunting. I find that the people you meet and the places you accidentally discover are the things that shape your journey. Holland, Germany, Denmark, Sweden, Norway, Austria, Czech Republic, Slovenia, Croatia. I have backpacked India, Sri Lanka and Malaysia. Before coming back to the UK and converting the Master. I would love to go back to Iceland and spend more time getting off the beaten track there. I have no destinations in mind but as I want to focus on learning to surf this year, Portugal and Morocco might be a good place to start. What’s the best thing about Vanlife what is something you don’t like so much about it? 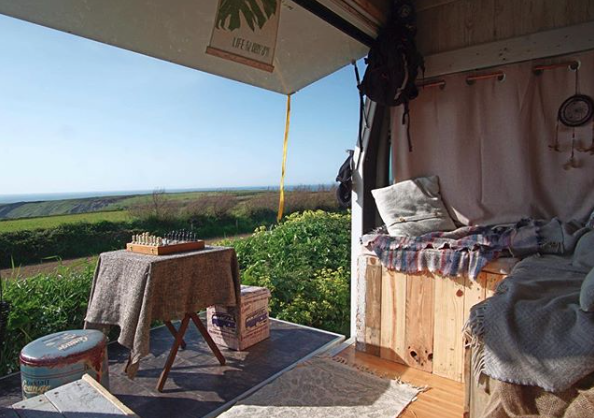 Best things about living in a van is you can wake up and go to sleep wherever you want. Exploring new places, meeting locals, living a more active lifestyle and extremely low living costs. One day I can be climbing a mountain, the next I could be kayaking over to a glacier and the next sat in front of the fire reading a book. Not so much, finding places to give my clothes a proper wash, not just a hand wash. Being woke up at 3.00am by a car pulling up and have a full on rave lol. Food lol, I love to cook. If the last three year have taught me anything, it is to not plan much and just go with the flow. All I know is I really want to learnt to surf the waves out back, so that’s what I’m going to focus on. Where do you camp most of the time- do you wild camp or stay at campsites? Keep up to date with George by following her on Instagram @2bron2travel, YouTube, Facebook and through her website. Join Van Clan on Facebook, Twitter and Instagram for more stories of Girls Off Grid! 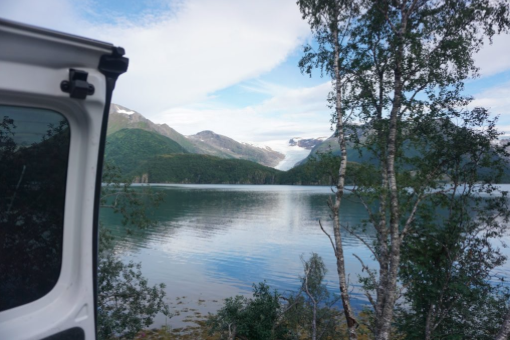 If you enjoyed this interview then read about another solo female vanlifer, Lisa, who is living her Vanlife out in the US! If you’re a female vanlifer we’d love to hear from you- email me on rose@vanclan.co to be a part of our Girls Off Grid series.